That of course would be The Deadly Gentlemen performing their original song “Police” at a sound check at The Lizard Lounge, an exemplary watering hole and listening room in Cambridge, Massachusetts. Another name for this clip might have been “What I Did On My Summer Vacation.” We shot this piece waaaaaay back, but it took many moons for us to do the footage justice. For those interested in such things, this project combines three separate takes of the song, each take covered by three cameras. Do the math and you’ll arrive at the fact that we were juggling nine video tracks throughout. To say that arriving the right recipe from so many ingredients took a lot of work is an understatement. While we were locked in our editing dungeon, time did not stand still for The Deadly Gentlemen. They were signed by Rounder Records and released a new album, Roll Me, Tumble Me. The group has been touring heavily as well. They have a bunch of gigs coming right up, including FreshGrass, the fast-growing festival at Mass MoCA up in the Berkshires. “Police” is actually one of The Dead Gents’ older songs. It can be found on the group’s first album, the excellent Carry Me To Home. To my ears, the earlier Deadly Gentlemen compositions tend to be more percussive, more punk in spirit than the more recent tunes. One of the many strengths of this band is the fact that they can shift gears between rocking numbers like “Police” and lusher songs like “Faded Star,” the tune featured in a previous post. There is a tenuous connection between the fiddle extravaganza in our previous post and this entry: Brittany Haas— ringleader of the house concert featured last time— is the fiddler in Crooked Still, the groundbreaking group that was banjo picker Greg Liszt’s home base before he started The Deadly Gentlemen. As you can see and hear, both Haas and Liszt are running on all cylinders. Thanks to Megan Lovallo, Jamie Lansdowne, Joe Stewart and of course The Deadly Gentlemen for their help with this project. ERRATUM: An observant reader pointed out that “Police” is based on an old-time tune called “Policeman.” You can check out a fairly orthodox rendition of “Policeman” here. There are some salient differences between The Dead Gents’ tune and earlier versions. You’ll note that, in days of yore, the cops merely sat on a log and no shots were fired. Phelps is accompanied here by partner Darol Anger (who on this tune has traded his fiddle for an octave mandolin) and mandolinist Sharon Gilchrist. The song— which is featured on Phelps’ latest album— was recorded at a notloB Music concert in Jamaica Plain, Massachustetts last Spring. In my estimation, these aren’t my finest three minutes. For starters, there’s the substance of my rant. For the record, I still believe there are good reasons why most bluegrass bands, from the Clinch Mountain Boys to the Punch Brothers, don’t employ percussion. Be that as it may, I have come to understand that anytime you try to proscribe something, you sound like you’re prescribe another thing. In that old post, my point was not that I wanted to define a specific “bluegrass sound.” If anything, I was staking out more or less the opposite position: that by leaving percussion out of the mix, bluegrass bands could more deftly control and alter their sound. I tried to argue that they could do this with ease and without sacrificing drive because of the uniquely percussive nature of bluegrass instruments. 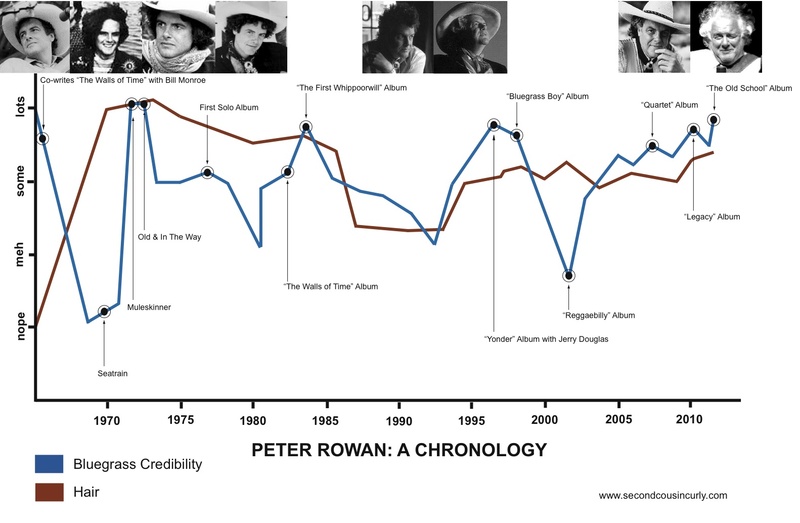 That’s the case I was making, but some viewers clearly believed that I was defending some canonical notion of what bluegrass was supposed to be. Some viewers said “right on!” to this blinkered perspective, while others allowed as how it was narrow-minded anti-percussionists like me who were responsible for the fact that all bluegrass bands sounded exactly alike. To all this I reply…oh, never mind. Anyway, setting aside whatever validity my argument might have, I’m not convinced that having some pasty guy (more Creepy Uncle than Second Cousin) gas on without even playing a dern tune is really what the public longs for. However, every time my finger inched toward the “delete” button, I noted that a few more people had written lively responses in the comments section. Figuring that fostering one of the few civil debates on YouTube was the least that I could do, I held off. Which brings us up to last week, when none other than Ringo Starr appeared to have commented on the video— quite a detailed and thoughtful response, in fact. I suppose hearing from a Beatle would be a big deal for anyone of my vintage, but perhaps I should explain the particular association I have with that seminal group. The first feature film I recall seeing in a movie theatre was The Beatles’ “Hard Day’s Night.” I was mesmerized by the experience, and I honestly think that initial, intense enchantment contributed to my choice of becoming a filmmaker. Once I recovered from my swoon, I alerted all my friends on Facebook, my followers on Twitter and all the ships at sea. Dear God, it’s me, Curly. Ringo Starr commented on my video! As for the lame clip that had attracted Ringo’s attention, well, as I noted in my reply to Mr. Starr, now that a Beatle had chimed in, I could never erase it! Fishy, no? Speaking of suspect aquatic life, in 2010, brothers Yaniv and Ariel Schulman released a provocative documentary called Catfish. The film chronicles the brothers’ attempts to attach flesh and bone to a dubious online relationship. For those of you who have yet to see the film, I won’t spoil the ride. Suffice it to say that the experience of watching Catfish is like entering a hall of mirrors, where you quickly lose track of whether what you’re looking at is a reflection or the thing itself. The moral is as obvious as the “truth” is obscure: In this day and age, don’t believe everything you see. Catfish the movie has subsequently spawned Catfish the reality TV series on MTV. On the show, the Brothers Schulman help other people investigate personal connections made via the internet. With episodes of Catfish rolling off the assembly line every week or two and stories like that of football star Manti Te’o making headlines, it’s hard not to look at “my Ringo” with anything other than a very jaundiced eye. I admit that this week’s post is something of a departure, in that it deals largely with a landmark near my home base in Beantown, a subject that might strike some of my far-flung readers as parochial. Bear with me, however, as I believe there are universal lessons to be drawn from this story. 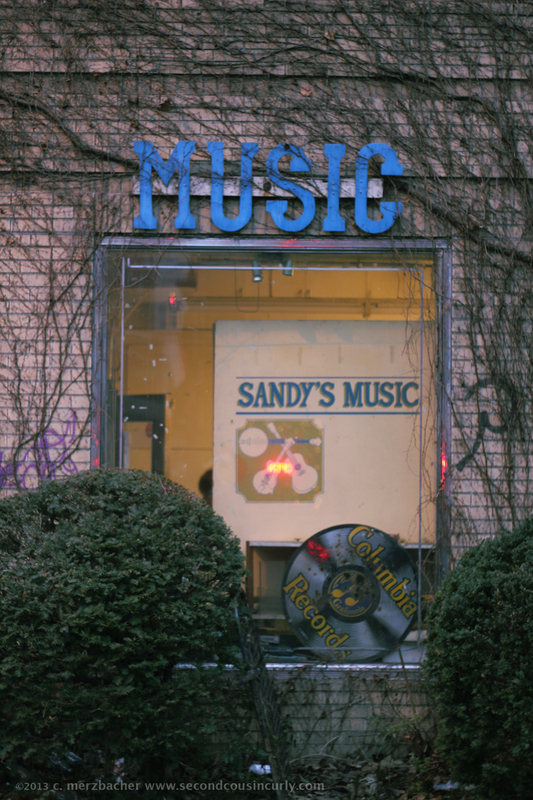 This past Saturday morning, I got word through Jeff Boudreau’s informative notloB Music blog that a Cambridge musical institution, Sandy’s Music, was closing. I was saddened by the news and thought I should stop by the shop to spend a few last bucks and say farewell. However, when I got to Sandy’s some hours later, I was shocked to find the store already mostly disassembled. 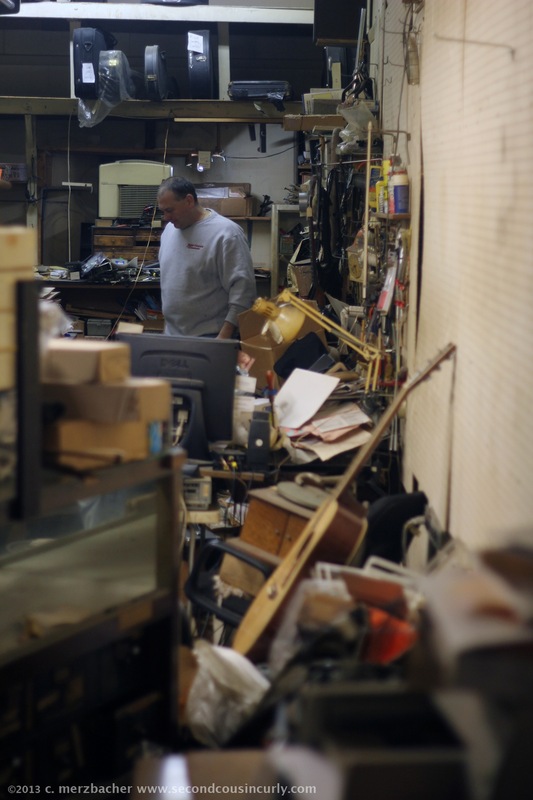 Members of shop owner Sandy Sheehan’s extended family were busily packing up the remaining merchandise and hauling a ragtag miscellany of cases, stands and instruments up from the basement. Sandy has been in poor health for some time now and therefore was unable to participate in the process of winding up the business that he started back in 1970. Located on Massachusetts Avenue midway between those famed institutions of higher learning, The Plough and the Stars and The Cantab Lounge— I mean Harvard and MIT— Sandy’s Music has served as a funky, cramped oasis for lovers of traditional American, British and Celtic music for over forty years. It was the kind of place where you could go to buy a ukulele for yer kid or an extra E-string for yer guitar and wind up having a 45-minute discussion about autoharp makers. That’s because presiding over the whole shambolic enterprise was the unassuming, owl-like presence of Sheehan. Were someone to write “The Ballad of Sandy Sheehan,” it could serve as an anthem for the whole Folk Revival generation. Sheehan and his brother were born in Canada but adopted by a couple in the Pioneer Valley, north of Springfield, Massachusetts. As a young man, Sheehan migrated to Cambridge, no doubt seeking to connect with others who shared his passion for traditional instruments and music. It was the 1960’s and the heyday of “group homes” in Cambridge. In these communal households, residents shared everything from cooking to political philosophies. Sheehan lived for decades in one of the most durable and renowned group homes, an old house known simply as Old Joe Clark. Though he is said to play a little banjo, Sheehan’s instrument of choice is the turntable, and it has been through the airwaves as much as anything that he has been able to share his deep knowledge of music with the public. Starting in 1986, Sheehan has hosted a show called “Traditional Folk” on WUMB in Boston. There are few pleasures to compare with driving along the Boston waterfront of an evening to the accompaniment of some chestnut from The Skillet Lickers or The Blue Sky Boys, followed by Sheehan’s succinct commentary in his distinctive burr. During Sheehan’s convalescence, the show has lived on through reruns. Until Sheehan is back on his feet, it will be hosted by Gersh. When he wasn’t installed behind the microphone or the counter of his store, Sheehan could often be found in the lobby of a concert hall or in the mess hall of a music camp, selling music and instru-ments. His wide-ranging involvement in the New England music scene earned him a Boston Bluegrass Heritage Award in 2009. He once told me that he would have liked to have gotten out to see and sell at more events, but that too often required him to close the shop on weekends. “That’s when we make the big bucks,” he said with a dry laugh. In truth, of course, Sheehan never realized much money from his passion, yet his store endured, despite decades of tumult in the music business. In closing at this time, Sandy’s Music joins a long list of local record, sheet music and instrument vendors who have recently thrown in the towel, a sad parade that begs us to ask, why now? In the 1980’s and 1990’s stores like Sandy’s were able to fend off the assault from big box stores like Guitar Center (for instruments) and HMV (for records) by focusing on hard-to-find, local and used merchandise. Of course, they also provided a much more personable shopping experience. In recent years, however, many of the stores have been done in by the Information Revolution. What’s interesting is that the internet picked these shops clean from two opposing directions. On the one hand, Amazon and Ebay gave customers access to a globalized marketplace that pushed prices down close to wholesale levels. On the other hand, Craigslist and the like provided ways for buyers and sellers of instruments to connect locally without the need of a middleman (unless you consider Craig and his list a middleman). Some of the small shops have managed to maintain a toehold by working their own internet sales very aggressively. Sandy’s Music was doing that a bit, too, but of course it’s very hard to be “heard” in the hurlyburly of the worldwide web. I don’t see any real way of stopping the march of time, regardless of whether the wheels are turning in the direction of progress or decay, but milestones like Sandy’s Music closing give us an opportunity to reflect on what’s lost amid all the change. 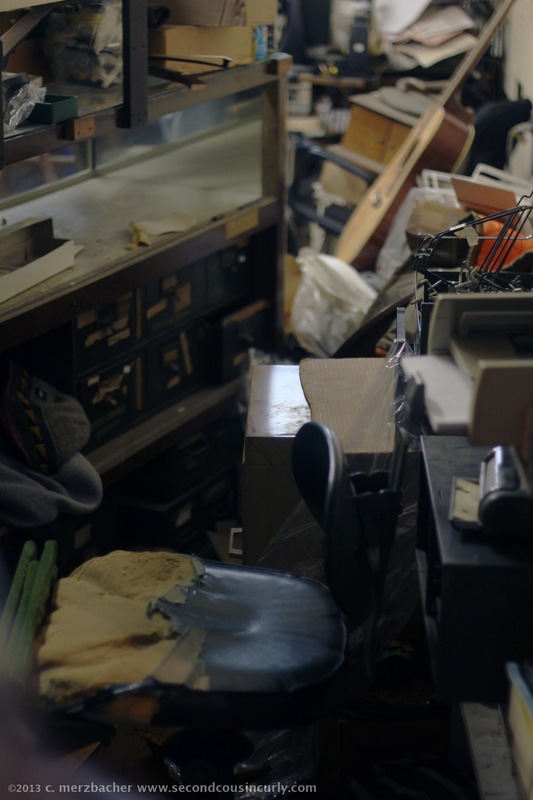 Small music stores haven’t just given us a place where you could seek out and talk with people like Sheehan who were knowledgeable about music; they provided day jobs for people who dedicated their lives to art and culture. It has never been easy for people to make a living in music, whether as a promoter, collector, DJ or performer. 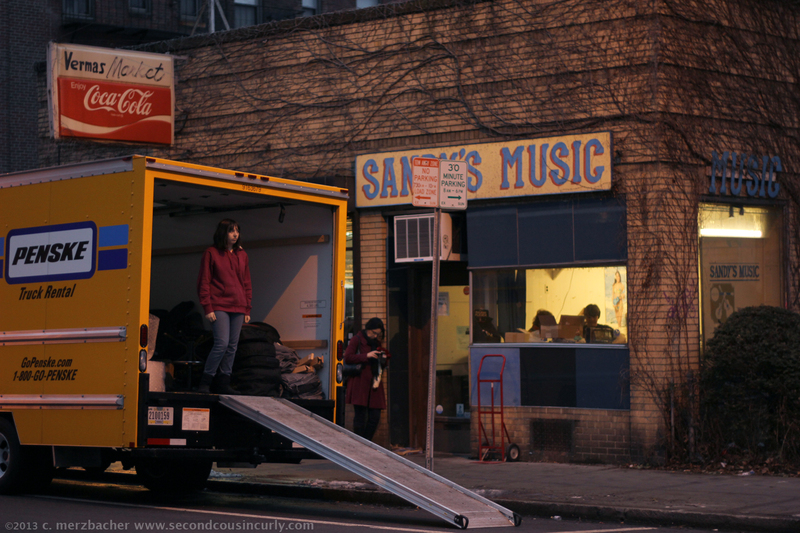 Stores like Sandy’s provided a way for such folk to devote themselves fully to music they loved. The shuttering of these stores therefore impoverishes the music scene not simply because it leaves us with fewer business outlets, but because it deprives the people who keep that scene alive of a livelihood. Although Sandy’s Music is no more, Sandy abides. Unfortunately, he currently abides in a rehab center, and that of course is very costly. That’s why Gerst and a big circle of Sandy’s friends and supporters have organized a benefit show on his behalf. 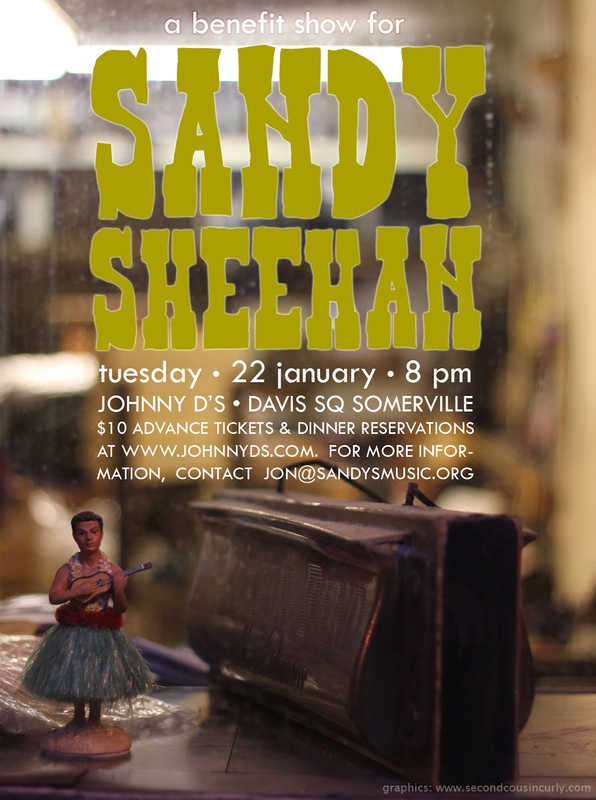 It’s coming up on January 22nd at Johnny D’s in Somerville, so now is the time to lock in yer reservations. A cavalcade of performers will be on hand, including The Dixie Butterhounds, The Hi-Tone Ramblers, Lorraine and Bennett Hammond, Put Your Hoe Down, Laura Smith and a small army of banjo players. On that last note, you are encouraged to bring your “weirdest banjo” and join the “Dreaded Banjo Orchestra.” An event not to be missed! With luck, Sandy himself will be on hand. P.S.— Thanks to Jeff Boudreau and Jon Gerst for much of the info included here.